The First Music CD Ever Released In The United States. 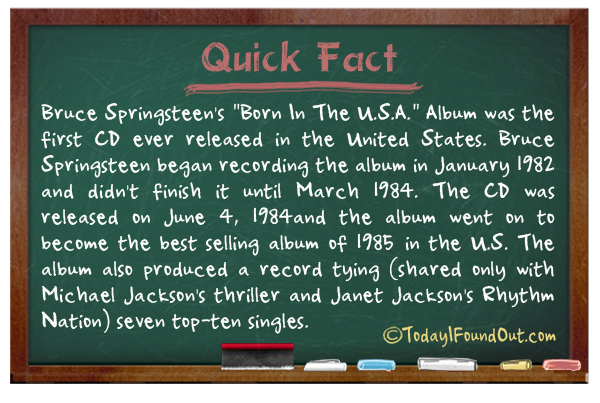 Bruce Springsteen’s “Born In The U.S.A.” Album was the first CD ever released in the United States. Bruce Springsteen began recording the album in January 1982 and didn’t finish it until March 1984. The CD was released on June 4, 1984and the album went on to become the best selling album of 1985 in the U.S. The album also produced a record tying (shared only with Michael Jackson’s thriller and Janet Jackson’s Rhythm Nation) seven top-ten singles. I bought the Cd in 1984 when it was released… I played it in 1989 when I had saved up for a cd player….